Emax started the year 2018 with an upgrade for Babyhawk drone even though it was already quite interesting for lovers of these gadgets. This upgrade makes the old model a Babyhawk R where R comes from racing and is the main novelty we’ll talk about in this Emax Babyhawk-R quadcopter review. First of all, the visible change is the design between the two models, Babyhawk R looking exactly like a racing drone. A negative thing that can be said in this category is the capacitor that is sticking outside the body and looks a little strange, but it only bothers visually, has no other negative aspect with which to interfere in any way, maybe the only thing that can bother is when you want to connect it to the computer through the micro USB slot. Of course, you can find the version without the receiver or with the standard FRSky receiver. You can find the 3-inch version with bigger propellers and higher power, but the battery will run faster. 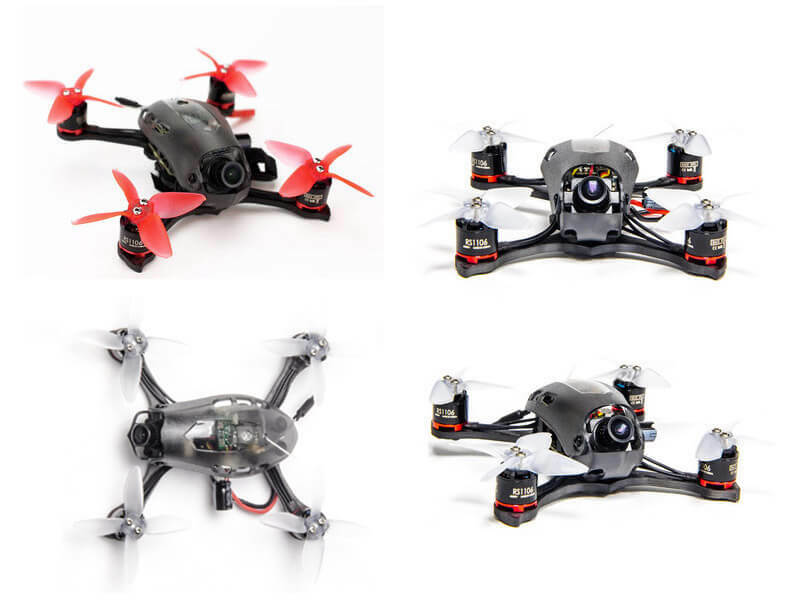 The components of Emax Babyhawk-r quadcopter are unexpectedly qualitative and are found at an exceptional price. For example, the Emax RS 1106 600kv engine is very powerful even though it has a width of 11 mm and a height of 6 mm. Another well-thought piece is the plastic canopy that can be detached by unscrewing two screws. It can be chosen from different colors, but the most used is black because it is less prone to dirt and the scratches are harder to see. Also removing the screws from the camera, it can be removed altogether. 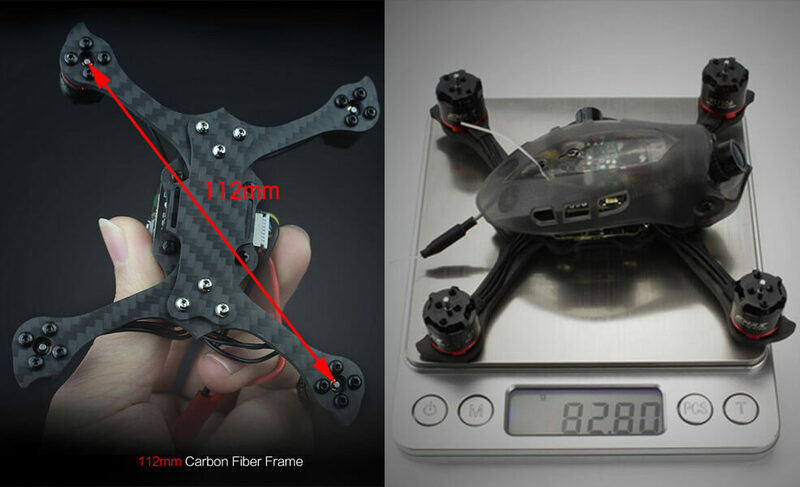 The 3 mm carbon frame is quite resistant, the only thing that could be disadvantageous is the screws that catch the drones’ arms, which gives it extra unwanted weight. Also here is an advantage, that only the arms need to change in case they break. 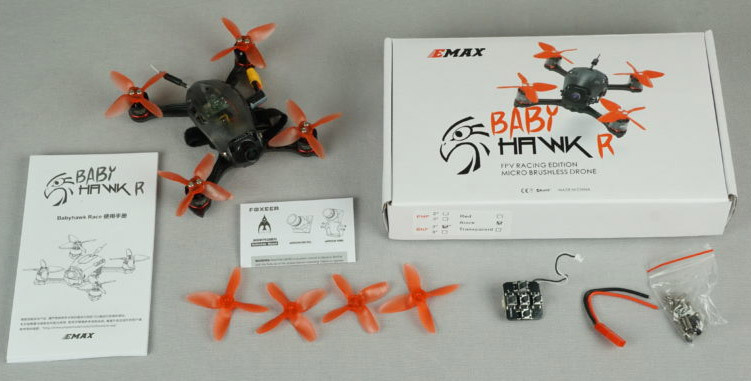 The Emax Babyhawk R comes with triple stacks containing the ESC, Flight controller and VTX. The ESC is a 4 in one stack, which means it doesn’t need an Electronic Speed Controller for each motor in part. The F3 remote works with Betaflight 3.2.2 and comes with OSD. This means you can see important information such as battery level, speed, or distance directly through the goggles screen. The video transmission process is done via VTX and has 5.8 GHz, 40 channels and you can switch between 25 and 200 million by the press of a button. A very important part of any drone is the camera, which makes this gadget not only fun but useful for some filming. Of course, this shouldn’t be for professional shooting but also for personal ones that will definitely be “wow” due to the Foxeer Arrow micro FPV camera. 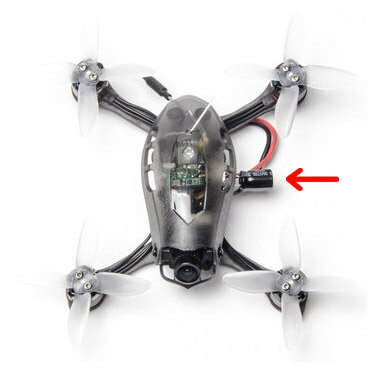 With a wide-angle 600 TVL micro 2.1mm Foxeer lens and a CCD sensor that is perfect for FPV. It can detach, as I said before or even change with another camera, but it is a very good one. The two versions you can choose from are BNF version and PNP version. The first is the Bind and Fly version that has an EMAX FRSKY receiver already installed. The second option gives you an XM + with two antennas and probably the best thing you can buy during this time. If you are a beginner, it may be a good practice first of all. But the Babyhawk R quadcopter is quite easy to use, being a racing drone might not be ideal for a beginner, at least in the sense that the user may not be able to use it at full capacity at first. On the other hand, to an experienced user, Emax offers a very good drone at an affordable price.